The Zen Parrot: Of Parrots, Politics, and Coffee: Born On The Fourth of July! Our Flock and Our Alpha Bird: Miss Bubba Boy! Born On The Fourth of July! Our Flock and Our Alpha Bird: Miss Bubba Boy! Miss Bubba Boy is our second bird, and our only bird with a known hatch date. She was hatched on July 4th, 1995! Miss Bubba Boy is a DNA sexed female Blue and Gold macaw (Ara ararauna). She was raised from birth by an elderly couple who were planning to sell their house, buy an RV, and retire to Arizona. Miss Bubba Boy would have gone to a breeding facility if we had not acquired her. She was bonded to the missus, and definitely favors women. Bubba immediately bonded to my significant other, and would scream any time she lost sight of her. Bubba attacked yours truly unmercifully for a couple of years before we finally worked out a relationship. For quite the while I wore heavy slippers around the house and got nimble into leaping in and out of bed if Bubba was on the loose! Now she hucks for me and makes a game out of chasing me around the house. Bubba loves to chase me down and back up the stairs into the basement! And god forbid if the cat gets around! If Bubba had been our first bird, we would have given up birds long ago! Bubba's original owners were convinced that Bubba was a boy. So Bubba was named after a Top Ten Country hit of the time by Mark Chesnutt, Bubba Shot the Juke Box. Who would have figured our first two birds were both named after songs! We acquired Bubba at age seven, and took the bird to our veterinarian for a checkup and DNA test. Well, turned out Bubba Boy was not a boy after all. Of course we could have saved the $50 fee. Within a month Bubba Boy laid four eggs! She laid each egg precisely three days apart, give or take fifteen minutes. By the third and fourth eggs, we knew exactly when it would be laid! She's now laid two sets of eggs, each set with the same precision. 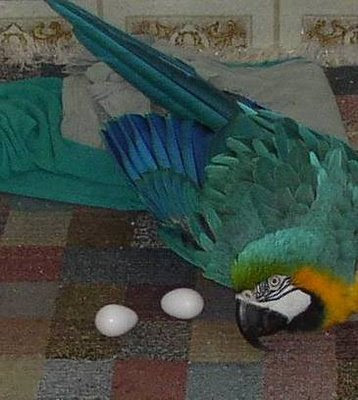 Of course the eggs were not fertile, not having a male macaw in the house. As our flock grew, Bubba quickly acquired the mantle of Alpha bird, and soon developed a serenity and poise to match. Roxanne, the Diva and our first bird, simply ignored Bubba, as she does any bird. But our subsequent birds all defer to Bubba, and show a level of respect that indicates they all understand that Bubba is the Alpha bird. The other birds will play with, challenge, and annoy each other, but they uniformly steer clear of Bubba. Alpha birds are not appointed or elected, they just are, and the others seem to understand that!